The Rambo Micklem Breastplate is an ergonomically 3- point elastic breastplate for the best in comfort and safety when jumping or out on cross country. Horseware chose to work with a 3-Point breastplate as they have been show to maintain better freedom of movement over a 5-point breastplate while jumping. This breastplate offers maximum adjustment possibilities on the sides of the neck, underbelly strap and detachable martingale attachment. An extra removable safety strap is included to clip across the withers of the horse for the rider to hold on to for extra security if needed (handy for working younger jumpers and for novice riders to help with balance. Additional top clips attach to D-Ring of the saddle or the included attachments for the stirrup bars which give a safer and more secure attachment point without damaging the saddle. Ergonomically 3- point elastic breastplate for the best in comfort and safety when jumping or out on cross country. Horseware chose to work with a 3-Point breastplate as they have been show to maintain better freedom of movement over a 5-point breastplate while jumping. This breastplate offers maximum adjustment possibilities on the sides of the neck, underbelly strap and detachable martingale attachment. 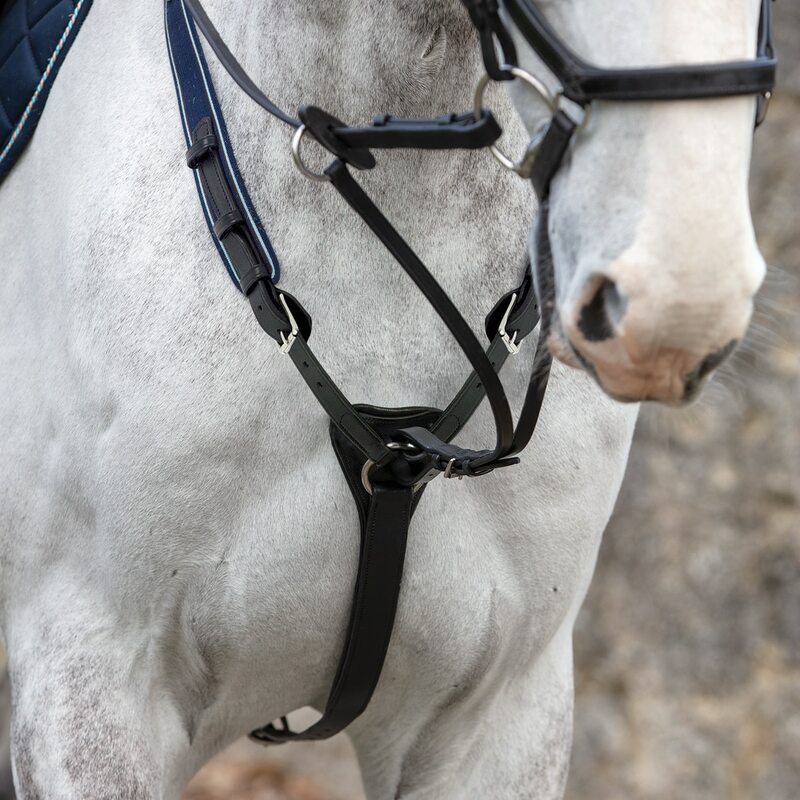 An extra removable safety strap is included to clip across the withers of the horse for the rider to hold on to for extra security if needed (handy for working younger jumpers and for novice riders to help with balance. Additional top clips attach to D-Ring of the saddle or the included attachments for the stirrup bars which give a safer and more secure attachment point without damaging the saddle.